The story lines for the University of Wyoming rodeo teams are as diverse as the Cowboys and Cowgirls who will compete June 13-19, at the College National Finals Rodeo (CNFR) in Casper. Action at the Casper Events Center begins Sunday with a "Bulls, Broncs and Breakaway" matinee at 1 p.m. followed by an evening performance at 4 p.m. that will follow the same event format. Two rounds of slack competition are set for 7 a.m. Monday and Tuesday. The first of five nightly performances begins Tuesday at 7 and concludes with the championship round Saturday night. -- The UW Cowgirls are the defending CNFR champions, and in fact, the women have won the national title two of the past three seasons. But the makeup of this year's version of the Cowgirls is all new with two of the three team members making their first rodeo finals and the other coming in as a transfer. Dana Weiser, a Wheatland junior, has the only CNFR experience for the Cowgirls. She competed the last two years for South Plains College (Texas) and was the national all-around runner-up last season to UW's Nikki Steffes. Weiser was third in the region in goat tying and fourth in breakaway roping. She is the only UW team member competing in two events next week. The other two UW team members are a pair of junior barrel racers -- Josie Davidson, Miles City, Mont., and Ilene Choal, Laramie. -- The Nikki Steffes Factor. Steffes, who used up her UW eligibility last season after a stellar four-year career that saw her win two CNFR all-around titles and three goat tying runner-up awards, is back again for the fifth time. However, her points will not count toward the UW team's totals because she is competing as an individual. Steffes is the regional student director and those contestants can compete at the CNFR. When she enters the arena in all three women's events at the CNFR, "UW" will still be attached to her name, but just not as a person who can score points for the Cowgirls. All she's done this year is win her fifth consecutive regional all-around title, while also taking the goat tying and barrel racing events and placing third in breakaway roping. "She's the best defense we have going for us at the CNFR," UW Coach George Howard says, because she will keep other teams from scoring. "She's making history because no individual has ever scored so many individual points and made such a huge splash at the CNFR." -- This year's version of the Cowgirls needed a late-season surge just to qualify for the CNFR. Only the top two teams advance, and UW didn't secure the second spot until the second-to-the-last day of the regular season. That late push gave UW the necessary points to hold off rival Central Wyoming College (CWC), while third-year program Gillette College dominated the region from the get-go. -- The UW men didn't qualify for the CNFR as a team, but luckily enough, several individuals will compete because they finished high in their respective events -- especially in team roping. The Cowboys were only the sixth-best team in the region this season. The Gillette College men won by a comfortable margin over perennial champion CWC. -- If the UW men are to make noise at the CNFR, points will definitely come from the five team ropers competing on four separate teams. Never before under Howard's guidance have so many team ropers qualified for the CNFR. UW will have four teams among the 52 qualified pairs competing. The list includes the region's best team roping duo of UW's Jordan Steele, a header from Aladdin, and heeling partner Dustin Smith of Gillette College. The regional runners-up are UW's Beau Miller, a Gillette heeler, and Gillette College's Cole Dorenkamp. UW also had the third place team -- Pavillion cousins Chance Nicholls, a header, and Dahl Nicholls, the heeler. UW managed a fourth team when header Riley Milward of Jackson qualified with partner Dane Kissack of Gillette College, who was the region's all-around runner-up. 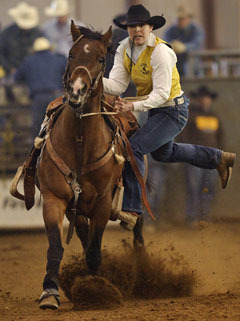 -- The only non-timed event contestant for the Cowboys is saddle bronc rider Merritt Smith, a Gillette junior. This will be Smith's third consecutive CNFR appearance and he looks to improve on last year's performance where he qualified for the short go, but did not place among the top scoring leaders.